Chef Jason Fullilove, who just left Ilan Hall’s The Gorbals, decided to move west into Beverly Hills toÂ take over the kitchen serving up Mediterranean at DaVinci. He has something special for picnickersÂ on-the-go – appropriately coined Al Fresco. ForÂ $30 per person, you get an appetizer, main course and dessert. Also, if you purchase Al Fresco for two, DaVinci will offer 15% off a bottle of wine. 9737 S. Santa Monica Blvd. The Macrobiotic mavens in town will actually be offering the most affordable options in this round-up, thanks to their 5-year anniversary and recent push to spread the gospel to all health-seeking diners around the city. This month, they offer two rotating $5 specials per weekÂ – and this week’s just so happens to be their Falafel Wrap and M Chopped Salad. Green Tea Roll Cake (Green Tea Sponge Cake made with Green Tea Soy Cream). All desserts from the Patisserie are made without the use of dairy, eggs, or refined sugar. Remember, the $5 specials are only available for take-away, so allow enough timeÂ for theÂ ordering and preparation. 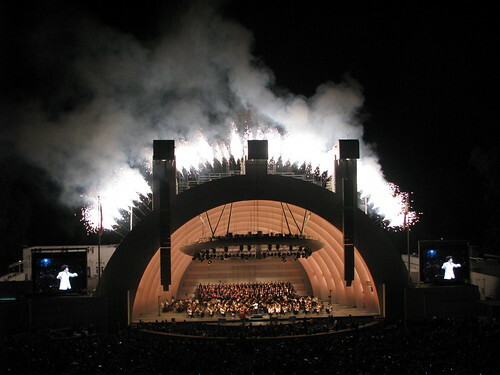 Chef Diana Stavardis has some things cooked up to get you dining at The Hollywood Bowl in high style and great flavor. Choose from a Cheese & Charcuterie plate, Bell Pepper Hummus, a Tuna Nicoise Salad, the Buttermilk Battered Fried Chicken Sandwich – the possibilities are endless. Be sure to peep the menu before you order since there are so many choicesÂ – BLD will package your food just so you can enjoy it while you enjoy your music. Call to order at least 6 hrs in advance; pick-up between 9 AM – 6 PM daily. The innovative Pasadena eatery is offeringÂ Bento BoxesÂ at $37 per person with aÂ minimum of 2 persons per order. In it, you’ll be treated to a cheese plate with accompaniments, salad, choice of a well-furnishedÂ main course and even dessert. You’ll even get a bottle of Pellegrino included with your take-away box. Just a side note: A great option to get to the Hollywood Bowl from Pasadena would be the Metro. Wa-lah! No stacked parking headaches (or parking at Hollywood & Highland just to walk back up the hill again). Call to order – order at least one day in advance. Cancellations require one day notice. Oh, so many glorious ways to enjoy your night at The Hollywood Bowl!! Have a great season!! This entry was posted in Beverly Hills, Culver City, Food, Hancock Park, Hollywood, lunch, Pasadena, robertson, West Hollywood, Westwood, wine and tagged beverly blvd, Beverly Hills, BLD, boxed dinner, boxed lunch, Culver City, Da Vinci, Diana Stavardis, Domaine LA, Elements Kitchen, Hancock Park, Hollywood, Hollywood Bowl, M Cafe, Melrose, Mozza2Go, Napa Valley Grille, Pasadena, Petrossian, robertson, take-away, take-out, West Hollywood, Westwood. Bookmark the permalink.